Society of Wireless Pioneers (SoWP) member Hedley B. Morris (195-P), born in Oakland in 1900, was a “Sparks” with the US Navy in World War I. Like some other members—Arthur Enderlin and Marlo Abernathy, both also with the US Navy, come to mind—he brought his camera with him and while “seeing the world” managed to take and save some historical photos that ended up in the SoWP archives. Which is where we ran across them recently. Morris would go on to become Captain Morris, serving in the other World War as a member of General Douglas MacArthur’s staff in occupied Tokyo. He had graduating from University of California Berkeley in 1923 and became a radio engineer, for many years working for RCA at their Bolinas, California and Kahuku, Hawaii stations. In the early days he specialized in alternators (ala Alexanderson); later he was Engineer-in-Chief at KPH. He left us quite a few pictures of the Bolinas and Kahuku equipment, which we will be posting soon. Along with that there’s an album page that seemed puzzling. There are photos of World War I German submarine U-126 taken at Plymouth, England, in December 1918. His notes say: “After German surrender at Scapa Flow – WW I (captured sub U-126)”. 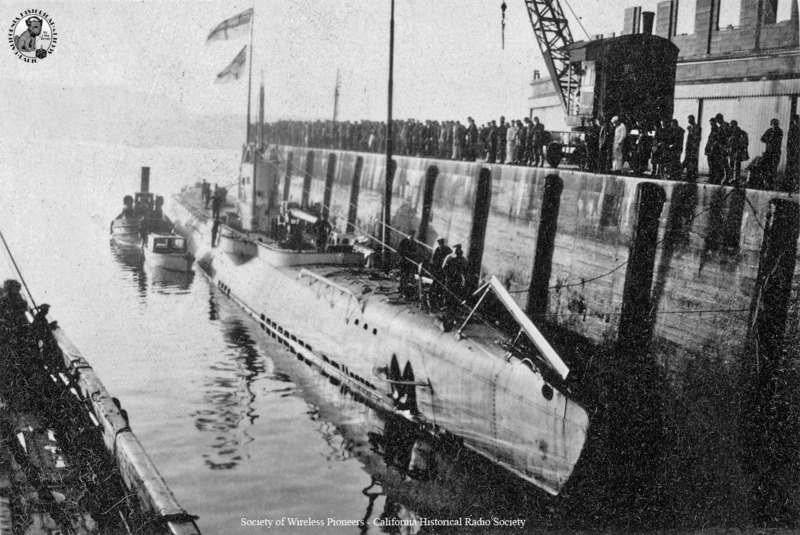 U-126 at Plymouth, England, Dec. 1918. Photo by H.B. Morris. The U-boat was equipped with a formidable 6-inch deck gun, and since it could carry many more shells than torpedoes, this was responsible for the demise of many an Allied ship. 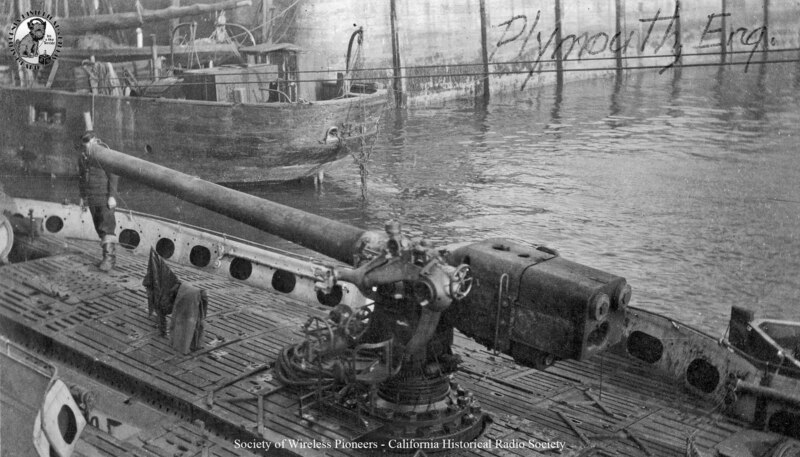 U-126 6-Inch Deck Gun. Photo by H.B. Morris. 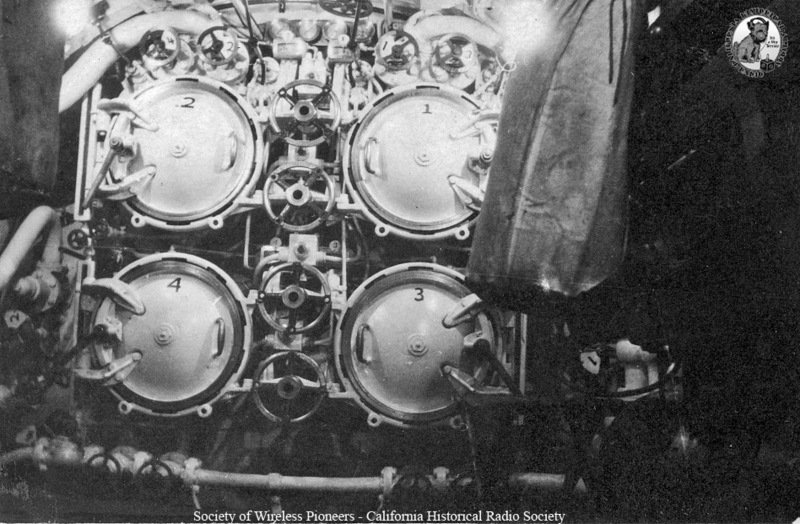 U-126 Forward Torpedo Tubes. Photo by H.B. Morris. Interestingly, we couldn’t find any reference to this incident in that otherwise limitless font of knowledge, the World Wide Web. But it does contain something else of interest. It turns out that earlier in the year the Parker, manned by the same US sailors, had rescued survivors from the British hospital ship Glenart Castle after the latter was torpedoed by another submarine, the UC-56. For this the Parker and its crew were commended by both the US and the British Navies. So having their ship bashed and their return to the States delayed at the last minute must have seemed like particularly evil payback. No wonder there was a fight! As for Hedley Morris, many years later he would retire to Corte Madera, where he was active in civic and charitable organizations. He left this earthly QTH in June of 1977. We remain grateful for what he did and for what he left us, which would otherwise have been forgotten.